North Carolina-born President James K. Polk declared war on Mexico on 13 May 1846 after disputes regarding the admittance of the former Mexican province of Texas into the Union in 1845 and the location of the Texas-Mexico border boiled over. Two weeks later, on 22 May, Governor William A. Graham of North Carolina called for volunteers. Early in the war the state raised 32 companies, all but 1 of which were rejected because they enlisted for only 12 months. The state issued a new call for volunteers in December, but by then war fever had cooled considerably. Even with a ten-dollar enlistment bounty, it took until February 1847 to enlist 10 companies for the state regiment, and those never reached full strength. Desertion and death from disease whittled the unit's numbers even before it left for Mexico. Most volunteer soldiers, including those from North Carolina, belonged to Polk's Democratic Party, which generally supported the war. Problems arose when Governor Graham, a member of the Whig Party, which opposed the war, appointed three fellow Whigs to lead the regiment: Robert A. Paine as colonel, John A. Fagg as lieutenant colonel, and Montford Sidney Stokes as major. The unit's existing officers strongly objected to these appointments, having expected to elect their own regimental commanders as was traditional in the state militia. The company from Mecklenburg County, refusing to serve under Paine, asked permission to join a regular army regiment and was transferred to the Third U.S. Dragoons. Two other North Carolina infantry companies were formed and added to the 12th U.S. Infantry, under Col. Louis D. Wilson of Tarboro-the original choice of the officers of the North Carolina regiment. Most of the regiment's officers and men considered Paine incompetent. Matters came to a head when the troops turned on Paine in August 1847. Control was asserted over the regiment only when Gen. John Wool posted regular troops as guards at the camp and temporarily relieved Paine. Although Paine had lost the confidence of most of the unit, a court of inquiry in early 1848 upheld his actions, and he remained in command until the regiment mustered out at the end of the war. The controversy spilled over into the North Carolina press, with Whig newspapers supporting Paine and Democratic papers taking the part of the disaffected men and officers. By the summer of 1847 the North Carolina regiment was protecting supply trains in Mexico; the unit never saw combat, although 172 troops died of disease. Another 62 men received medical discharges, but three-quarters of them died before arriving home. Interestingly, despite the mutiny against Paine, the North Carolina regiment had a very low desertion rate for a Mexican War unit. The companies of the North Carolina regiment returned home to muster out in July and August 1848. Even with the stain of the mutiny, the men were welcomed back with patriotic celebrations. 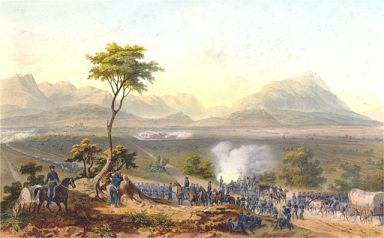 The North Carolina companies of the 12th Infantry and the Third Dragoons saw action in the final battles of the war as the U.S. Army fought its way to Mexico City. The North Carolinians of Company G particularly distinguished themselves at the Battle of the National Bridge on 12 Aug. 1847. Outnumbered by enemy troops, the Americans were pushed back and forced to abandon their two cannons on the bridge itself. Led by Lts. H. B. Sears and Edward Cantwell, a dozen men from Company G dashed forward under fire and recovered one of the cannons left on the bridge. After this action, the tide of the battle turned and it ended in a U.S. victory. The popular commander of the 12th Infantry, Colonel Wilson, died of disease before the war ended. Wilson County and the town of Wilson were named after him. A peace treaty was signed in February 1848 after the fall of Mexico City. About one-third of Mexico's territory was ceded to the United States, creating its modern borders, except for the Gadsden Purchase (1852) lands, Alaska, and Hawaii. Although limited, the military experiences of the Mexican War gave a handful of North Carolinians some firsthand combat training that would be put to use in the Civil War. Several North Carolina officers in the regular army, including future Confederate generals Daniel H. Hill, Braxton Bragg, and James G. Martin, distinguished themselves during the fighting in Mexico. William S. Hoffmann, North Carolina in the Mexican War, 1846-1848 (1959). Lee A. Wallace Jr., "Raising a Volunteer Regiment for Mexico, 1846-1847," NCHR 35 (January 1958). "The U.S.-Mexican War." PBS.org. 2006. http://www.pbs.org/kera/usmexicanwar/index_flash.html (accessed March 7, 2013). Mexican-American War lithograph by Adolphe Jean-Baptiste Bayot, based on a drawing by Carl Nebel. Originally published in the 1851 book The War Between the United States and Mexico. Image courtesy of LearnNC. Available from http://www.learnnc.org/lp/multimedia/12177 (accessed October 10, 2012). 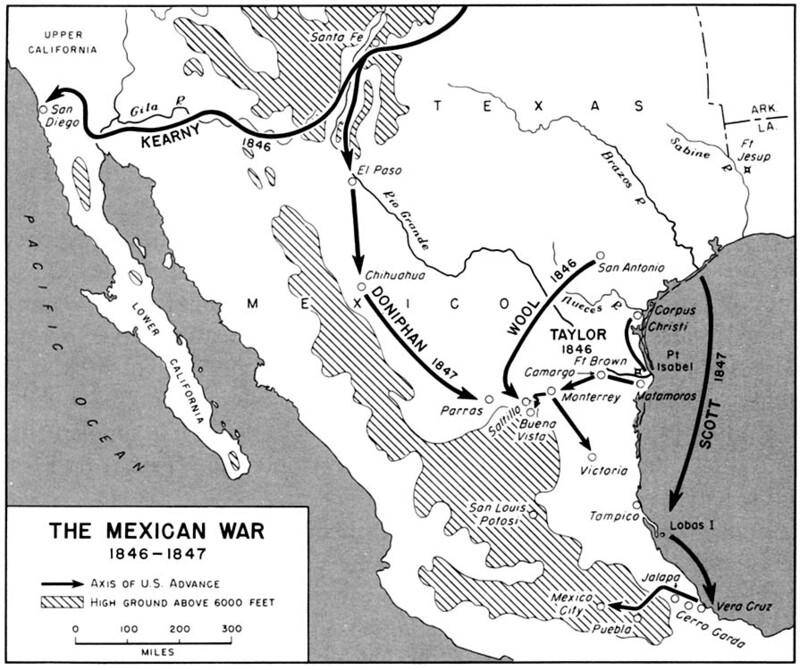 The Mexican War, 1846-1847: Map of operations. From American Military History, by the United States Army Center of Military History, 1989. Available from http://www.learnnc.org/lp/multimedia/12366 (accessed October 10, 2012).